How to create a meet the team page for your website. The work around the Viscose staff portraits. Often when visiting a company website, you’ll come across a page where you’re able to ‘meet the team‘. This is a way that companies provide you with an opportunity to put a face to a name. Whether you’re a a new customer or a someone who’s been dealing with said company for a while, it’s always nice to know what the person you’re communicating with looks like. 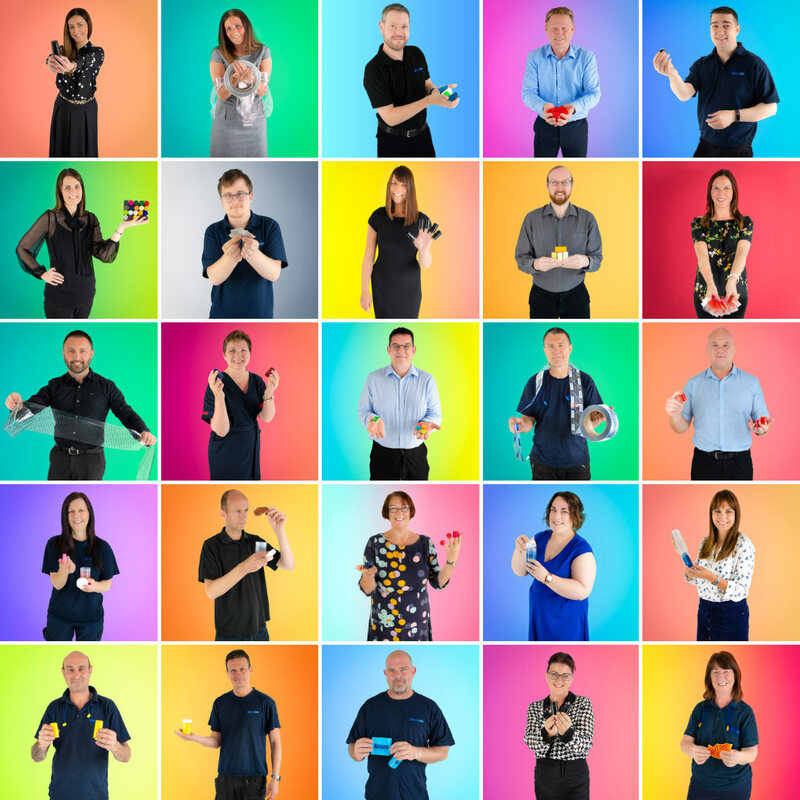 Viscose recently approached us with the request of setting up a date to photograph their staff members. They wanted to replace the pictures they’d taken themselves and were currently using on the ‘contact us’ page on their website. 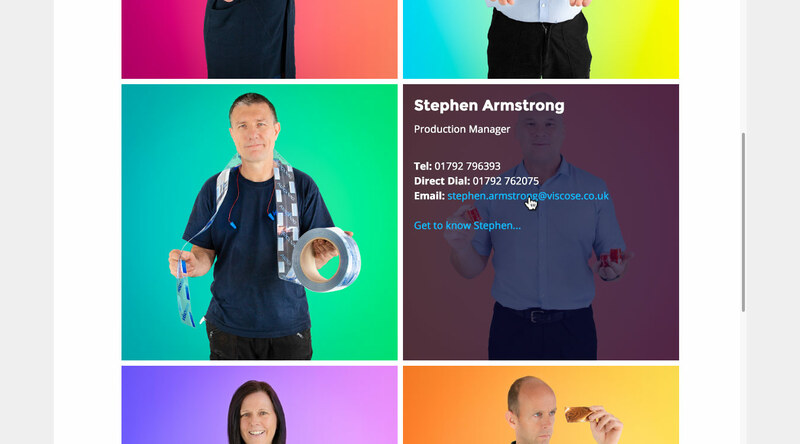 Having tied in bright and eye catching colours with the more recent Viscose design work, we decided that we should move forward with this style and apply colourful gradients as backgrounds to each staff members portrait. 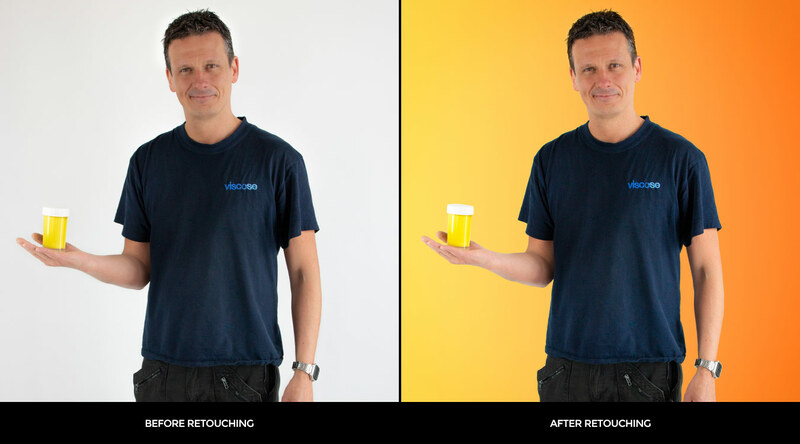 To get the best results for this project, we photographed each staff member against a white backdrop, making no compromise when it came to composition or lighting. 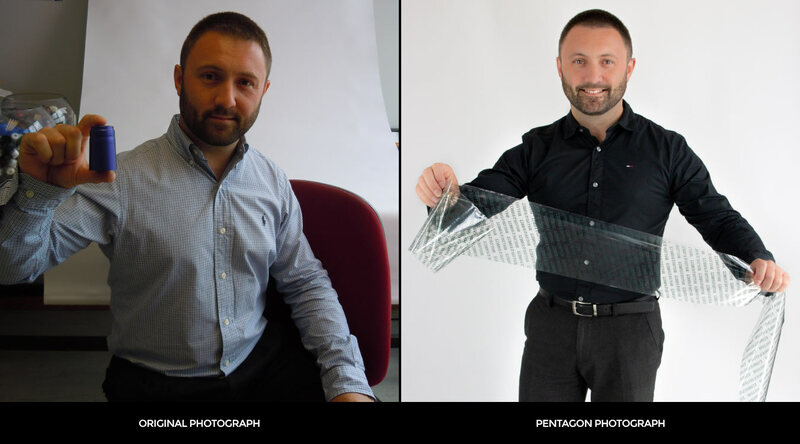 Using the products that Viscose produce as props meant we were able to add a little more charisma to each portrait, while avoiding a bland passport style photo. Above you’ll see the original photograph used on the Viscose website along side the new portraits that we took. The main things that stood out to us when preparing for the photo shoot was the subject composition. As we knew we would be retouching the images after all the photographing was over, it was important that we set the shot up in a way that would capture the best subject position to work with after shooting. When comparing both images, you’ll see that the harsh shadows cause a serious loss of detail from the subjects face in the first picture. It was vital that we made sure our lighting was perfect. We set up each photograph to make sure no harsh shadows were casting over any part of our subject. As one of Viscose’s main requests was to capture images that projected the friendly and welcoming nature of the team, it was important that we interacted with our subject so they felt relaxed in front of the camera. This included a little chatting and light conversation that would keep the staff members from freezing awkwardly in front of the lens. This is a very minor detail in the production process – but it goes a long way. Once all our photographs were captured it was time to come up with a colour pallet of gradients for each different picture. We produced a colour pallet of bright gradients that would compliment each other and tested them to see how they’d look when sat side by side. 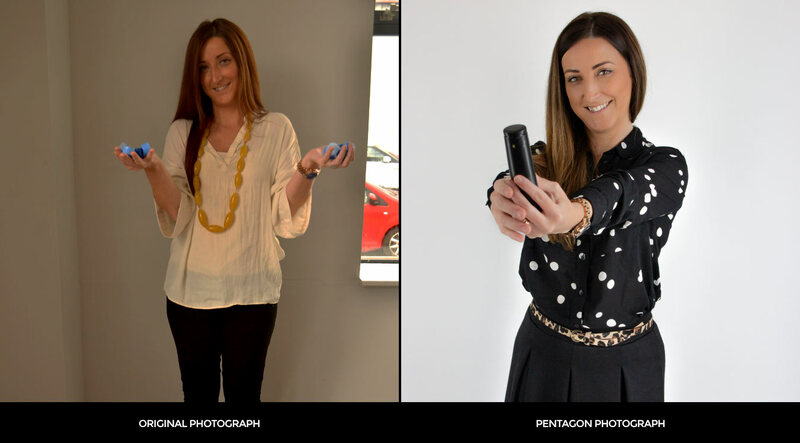 This helped us gain an understanding of how the final images would look when uploaded onto the contact us page. Developing an appropriate colour pallet was one of the key factor that would help keep the websites target audience interested in the contents of the page, while letting each staff members contact details stand out individually. 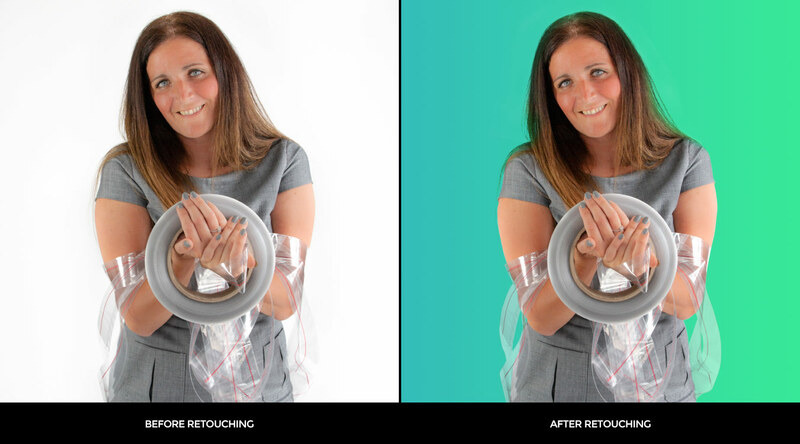 Once a colour pallet was selected, we moved on to retouching. Props and clothing colour were taken into consideration when deciding which gradient would go with which picture. The final stage of the project was to implement the new images into the website. When designing the Viscose CMS system, we developed the contact us page to display each individual team members contact details separately. This was a subtle interactive element that would keep the page free from an overload of information, giving the audience a choice of who they wanted to contact. This also kept usability intuitive, efficient and satisfying for the user. If we can help you with a similar project for your company, please don’t hesitate to get in touch. You can give us a call on: 01656 668 779 or email us using the contact form.